A 32 year old female presented to an oral surgeon with slight buccal expansion of the mandible. Radiographs revealed a lesion causing divergence of the apices of the two lower left bicuspids. 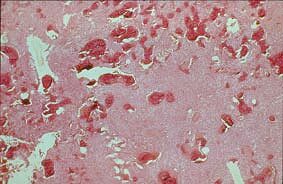 The tumor was well-delineated, exhibited inferior cortical expansion and showed evidence of patchy deposits of calcifications. 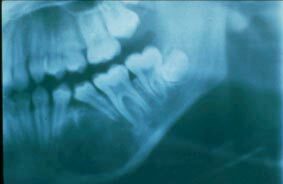 The round appearance, inferior cortical expansion and presence of hard deposits favor a diagnosis of cementifying or ossifying fibroma although other calcifying lesions should be considered. Slide 1 (low power, H&E). 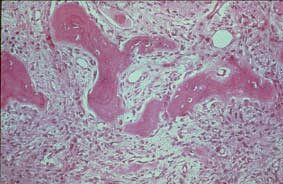 This slide shows variously sized calcified deposits (you can not tell whether it is bone or cementum at this power) with a cellular connective tissue background. Slide 2 (high power, H&E). The hard material contains osteocytes and appears to be bone. These bone trabeculae are bordered by scattered osteoblasts. 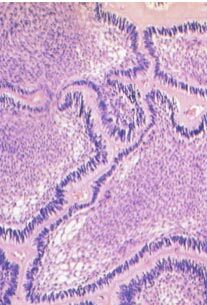 The supporting connective tissue is cellular and contains uniform basophilic nuclei.